My scanner is really terrible at handling large format documents. It only fits up to legal size, so that made it a little hard to scan in this latest batch of stuff. I apologize for the crude re-piecing of the first page - hopefully everything is still readable without inducing a migraine. It's pretty obvious I'm on an early 90's tech kick at the moment (and, I suppose, the last 4+ years of this blog). Some stuff survived this transitional period, some didn't. 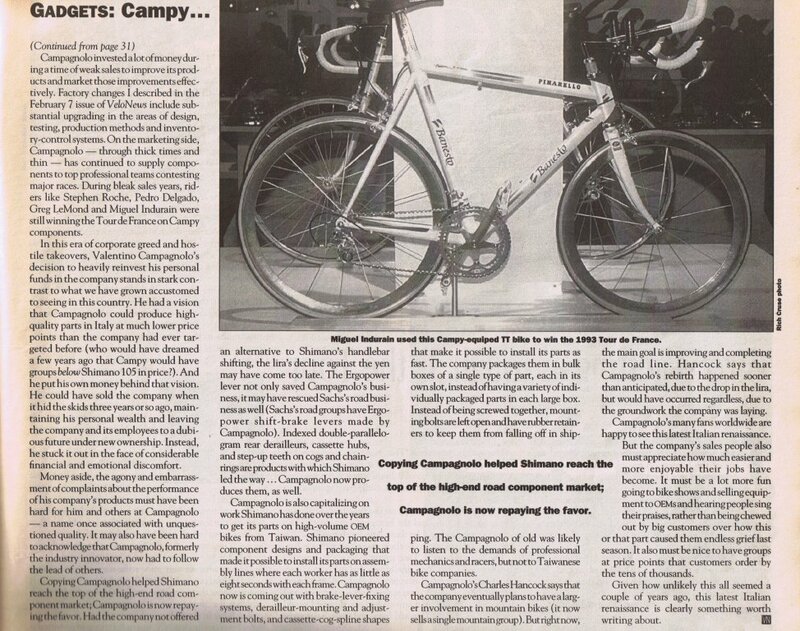 The scans below cover 2 items, one of which fizzled out, and one that talks about the comeback of Campagnolo. 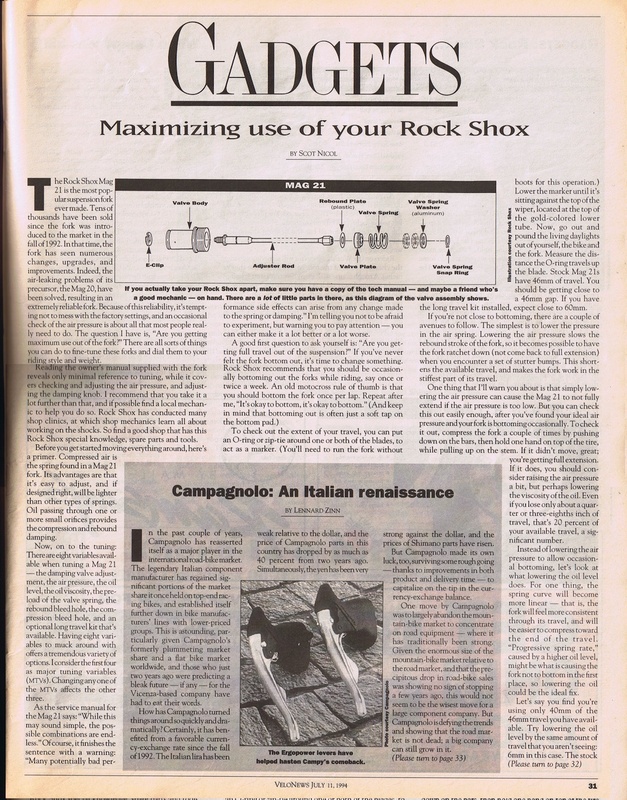 From the July 11, 1994 VeloNews, Maximizing use of your Rock Shox and Campagnolo: An Italian renaissance. Read on! 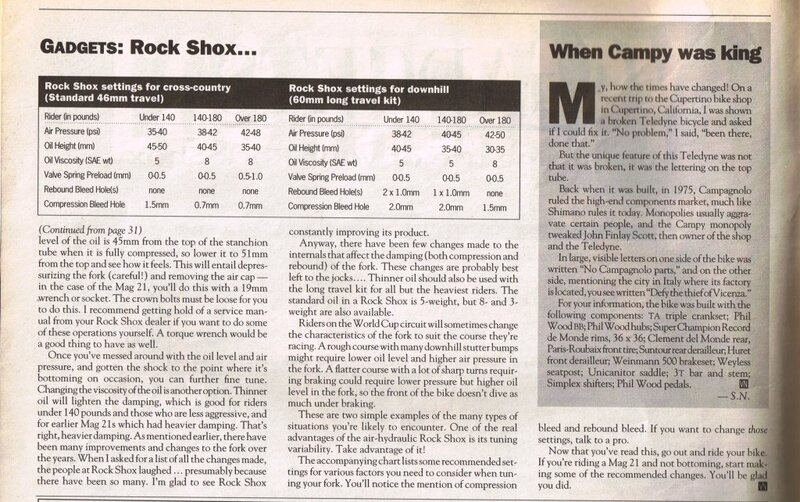 No, no, I'm not going to start talking about vintage MTB stuff. The Mag-21 IS almost identical internally to the Paris-Roubaix, however, and tuning is a pretty similar experience. Ready to tune your Paris-Roubaix now? Whaddya mean you don't have one?! Sorry, the crappy scanner necessitated chopping the very top of Indurain's TT bike.